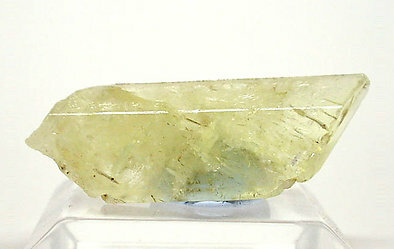 Excellent twinned crystal of this rare lithium phosphate. Very transparent and intense yellow color, with well defined faces and edges and excellent brilliance, that makes clear the twin plane. This specimen is accompanied by the label of the Wendy and Frank Melanson collection, from Canada. We will send the label to the buyer. Doubly terminated (although the left termination it is not sharp) pretty transparent, an excellent representative of the species. 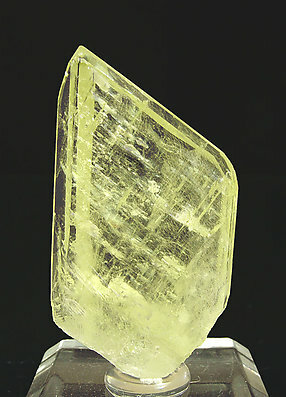 Photographed on page 179 of the Spanish mineral book: 'Minas y minerales de Iberoamérica'.